How Can CareCarma Help You? Once upon a time, family members all lived in the same small community, sometimes even under the same roof. If someone needed support, you could simply reach out and touch them. This ancient, localized support system largely disappeared with the emergence of the modern nuclear family. Today, the family is often dispersed across an entire continent, sometimes around the world. So, how can we provide care to our elders or other members of our family who have had an accident, a sudden illness or even to a new mother and father with a newborn baby? Suppose there was a way to close the distance between family members by reuniting them in a virtual community. A place where they could once again simply reach out and touch each other when in need. 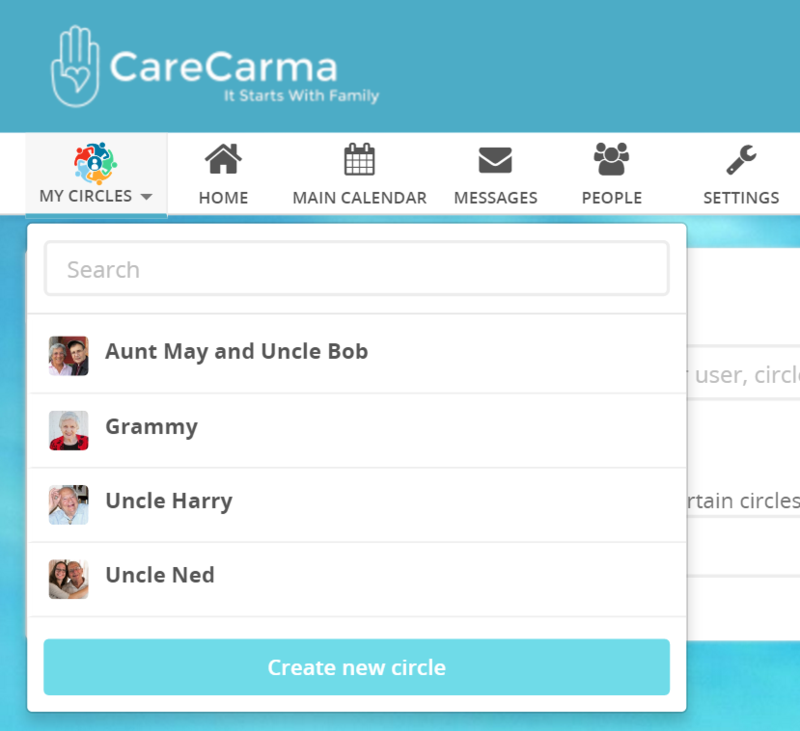 CareCarma Circles helps you organize your family into a care team that can bring support to family members in need. 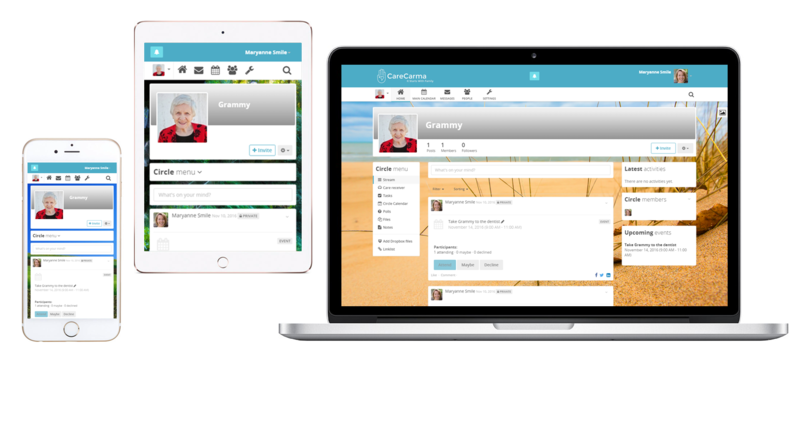 CareCarma CoSMoS helps family members connect, interact and communicate more easily, reliably, and productively. CareCarma Communities brings Circles together with others that have special expertise and/or who are local to geographically distant family members in need. CareCarma Contacts provides easy access to other, outside resources and services, if and when you need them - from finding a home cleaning service to finding a live-in caregiver. 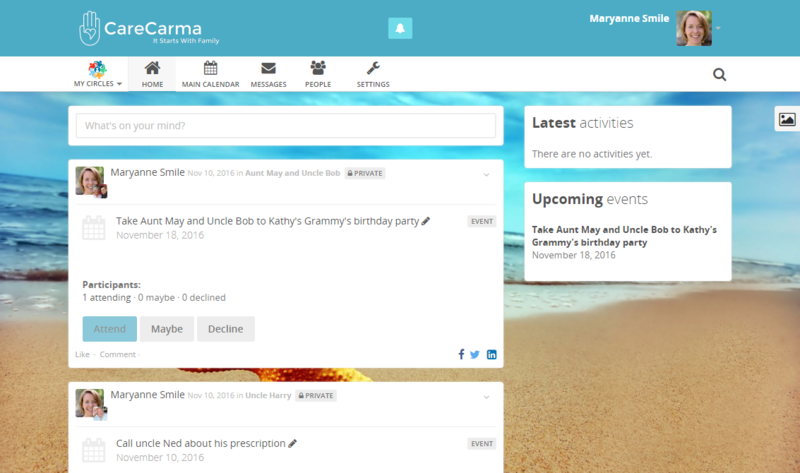 From here you can access information for all of your activities in all of your circles and communicate with the entire CareCarma community. This is the private section. Only people that have been invited to the Circle have access to it. You can setup an unlimited number of CareCircles and they can been defined any way you prefer. They can be people, events, groups - anything. Once you've created a circle, you have access to a large array of tools and functions. 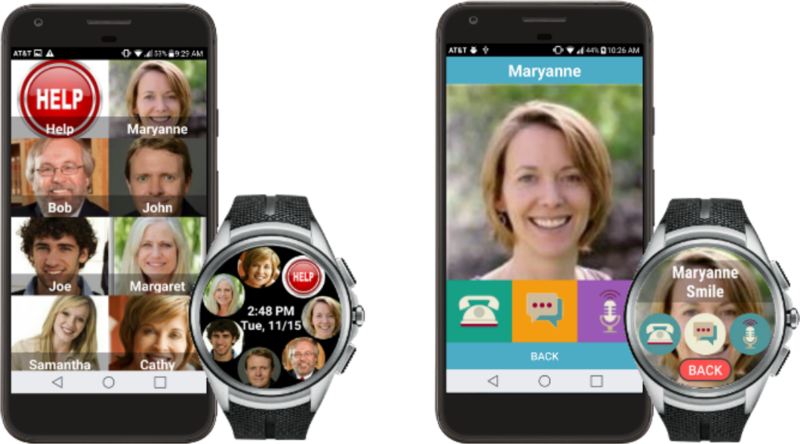 Create and assign tasks, schedule events, upload and manage files and images and setup access to a smart mobile device such as an LG Urbane 2 Watch. 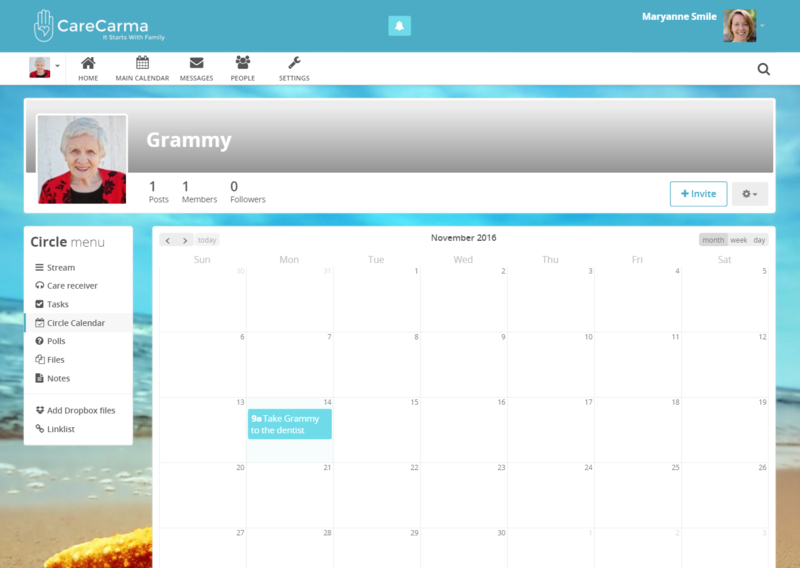 CareCarma is compatible with most browsers, so it will work on Windows, Apple and Linux PCs. A mobile version of CareCarma is available for both Android and iOS devices. 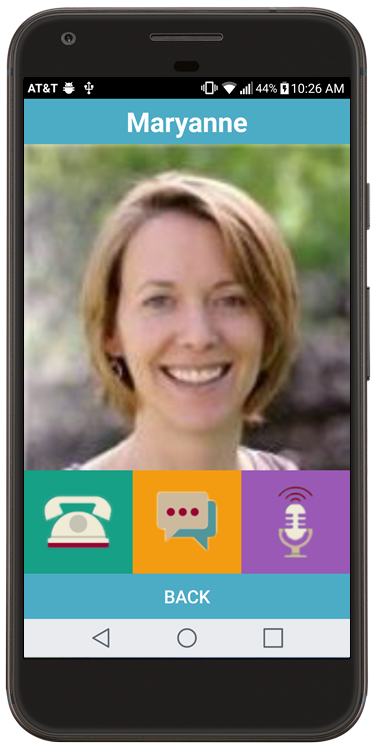 CareCarma CoSMoS provides a simple, easy to use interface for elderly users (or anyone, for that matter) that enables them to make and receive calls and send and receive text messages without digging through piles of menu layers. 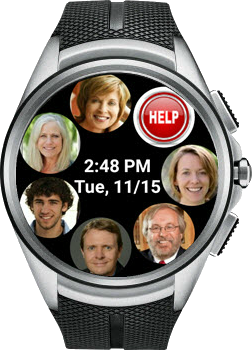 Put your favorite people directly on the face of your Android Wear watch or on the main screen of your Android phone. Then simply tap their picture to make a call or send a text. 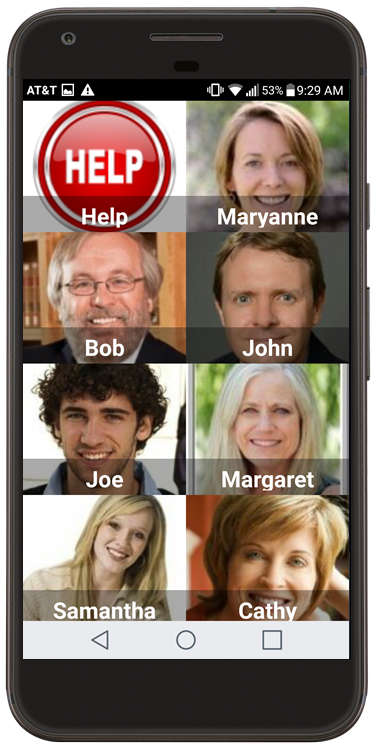 A tap on the Help Button automatically notifies friends and family on a pre-programmed call list and then dials 911. You manage all of these CoSMoS functions remotely for your elder using the CareCarma CareCircle dashboard. CareCarma CoSMoS WATCH is designed to be used with the LG Watch Urbane 2nd Edition. CareCarma CoSMoS PHONE is designed to be used with any Android 5.0 or higher mobile phone. We will be expanding CoSMoS to other wearables, including smart eyewear, and adding powerful new features in future releases. Stay tuned! Will help you build a CareCircle team by expanding your access to both paid and volunteer services. This will include everything from arranging a ride for your loved ones using Lyft, to finding a home cleaning service, or locating a volunteer to visit them. All of these services will be integrated directly into CareCarma’s task management and calendar functions to enable you to easily keep track of everything. You will also have the ability to order background checks on the individuals providing these services. Expansion of our CareCarma CoSMoS services will further improve your ability you reach out and touch someone you love from thousands of miles away. The current version of CoSMoS provides easy and safe communication between CareCircle members and your care receiver. Our next version will also allow you to collect information about their activities. You’ll be able to access reports summarizing data from the pulse, accelerometer and gyro sensors. This will provide a view into their level of day-to-day activities and compare it to their historical patterns. You will also have remote access to the onboard GPS sensor, which will permit you to monitor their travel patterns and send you a notice should your loved one travel beyond a certain geographical area. Will provide sophisticated analytics based on machine learning algorithms that we’ve been developing under research grants from the National Institutes of Health and the National Institute on Aging. CareCarma Cortex uses state-of-the-art AI that will collect and analyze sensor and other data to provide a clearer picture of your loved one’s wellbeing. It is being designed to recognize each individual’s pattern and then compare them with those of a larger group or cohort. The ultimate goal of CareCarma Cortex is to predict events, such as falls, before they occur – thereby helping to prevent them. Most of us know what a social network is and how useful it can be in improving communication between people that are separated by distances. You may also know about project management systems. They're used to help companies, big and small, organize themselves into efficient teams to accomplish just about any task - from developing new software applications to building a new commercial airliner. CareCarma Circles brings these two concepts together. Circles enable families to develop a family team dedicated to a “project” designed to support the needs of a family member. Circles makes team formation simple and easy and then helps each team member to organize and coordinate their activities using a private social network and easy to use project management tools such as tasks, calendars, shared documents and real-time communication. For example, suppose your elderly mother or father needed more help taking care of their day-to-day needs so that they can continue to live independently in their own home, rather than having to move to an assisted living facility. Circles enables family members to setup a project to provide this support. It starts with a team leader who invites other family members, friends and health care professionals to become part of the team. Then, any team member can be responsible for planning and scheduling task and deliverables that provide this support, no matter how close or far away they may live from the people who need it. There’s so much technology everywhere that you would think that using it to help care for someone you love would be easy. Unfortunately, it’s not. Trying to put together a hodgepodge of gadgets and get them to do something useful can be complicated, time consuming and frustrating. At CareCarma, we help you overcome these hurdles by building software and hardware that’s designed to solve the most commons problems and then integrate them directly into the CareCarma platform. You decide what to use and when. Then simply download and install these solutions, turn them on and they’re ready to go. Some of them are even free. It’s that easy. Speaking of easy, we also build these solutions to help grandma and grandpa get onto the technology playground with you. We do this by streamlining and simplifying otherwise confusing and complex technology. Technology that’s easy for our elders - who could have imagined that? Our first product, CareCarma CoSMoS is a free download designed to work on a brilliant product called the LG Watch Urbane 2nd Edition. You can find this product through your current mobile provider’s store. 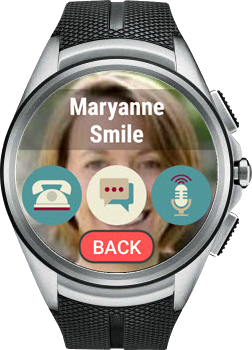 This smart watch offers a complete communication solution, including the ability to make and receive calls and messages directly (i.e. you do not need to connect it to a mobile phone to make or receive a call or message). We’ve integrated the CoSMoS app into CareCarma so that a CareCarma Circle administrator can remotely provision and manage the watch from anywhere in the world. This is the first time such technology has been used to remove this technical burden from the elder using the wearable. We will be adding powerful new features to CareCarma and CareCarma CoSMoS that will expand on these capabilities and extend CoSMoS to other mobile and wearable devices. Stay tuned!